Founded by William Penn. Laid out in 1682. Chartered a city, 1701. Pennsylvania's capital until 1799; the nation's to 1800. County was one of Pennsylvania's original three, formed 1682 and consolidated with city in 1854. 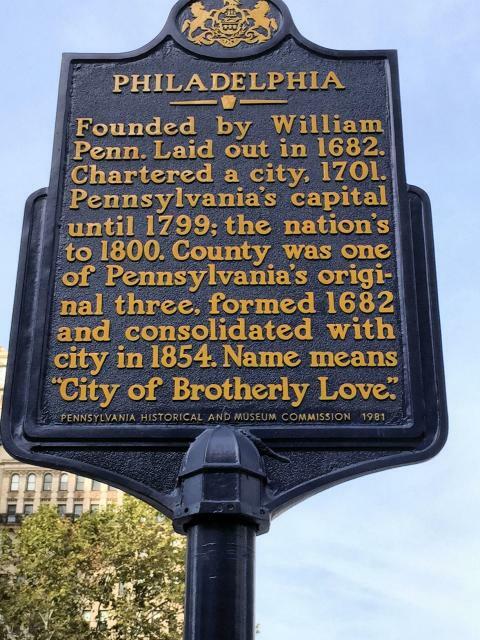 Name means "City of Brotherly Love." This marker can also be identified by its HM code. You can use the hashtag #HM1KMF in tweets, and any other place where you might refer to this marker, including when searching on this site.